Last week I went with a group of young people from the Channel Zer0 media club and their facilitator Gary, to see the Black Audio Film Collective exhibition at Arnolfini gallery in Bristol. For me it is an important exhibition as Black Audio are part of the reason why I do what I (try and) do, which is makes films (particularly exploring Afrikan [Black] British stories) and support others to make work for themselves. I was already at film school (Newport) the first time I came across them, in the mid 90’s, but they definitely inspired me with confidence in two vital areas of filmmaking; 1) Be bold & inventive with your creative approach, and 2) Don’t hold back on what you want to say. 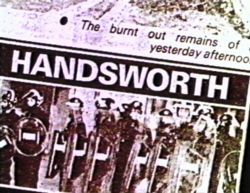 ‘Handsworth Songs’ and ‘7 Songs for Malcolm [X]’ are an education in pushing the envelope in documentary production for anyone. Style and content / content and style. Hand in hand. Essential viewing. Those films restored my faith in not only endevour of making media, but also in the importance of getting hidden voices heard. Another reason I hold Black Audio high up on my list of influences is because it was out of the film collective/workshop tradition, that also included London’s Sankofa Films, that inspired Black Pyramid Film & Video Project in Bristol; the only black production company in South West England. When I left Newport it was Black Pyramid that I began working for, and out of that came my longstanding working relationship with Rob Mitchell. We set up Firstborn Creatives 7 years ago and still going strong. Anyway….that’s enough about me, what about the young people’s reaction to ‘Handsworth Songs’ and ‘7 Songs for Malcolm’? These are two comments I heard. That’s not really fair as there were many (correction: many-ish) positive comments as well, but these two comments cut me deep and broke my heart, as these were mostly black young people not realising how important these works are to African British culture and what this movement represented – the first time en masse Black people had made media for themselves in this country. I had to bite my tongue and diplomatically encourage a conversation about their feelings whilst trying not to dictate or preach. I think I got away with it, but it wasn’t easy. And it’s true. What’s important for me doesn’t have to be for them, no matter what cultural background they are, but…. …and there is a but here…..
…for young members of a media club surely they SHOULD have an appreciation of such things, even if it wasn’t to their taste. I don’t like ‘Birth of a Nation’ and am not fond of its director DW Griffith due to him being a supporter of the KKK, but I still recognise the important impact he had on the development of filmmaking. That’s one of the things with community media education projects. It’s informal. No one can be preached to and everyone’s opinion is valid, within reason of course. Opinion can be challenged, but I am not their preacher and they are not my flock. I guess the main thing is that they were exposed to that work. They now know it exists. They had access. Whether they choose to access it or not, whether they choose to try and understand it or not, and whether they choose to create their own works or not is entirely up to them. They are their own people and have the right to choose, but as facilitators the least we could do was make them aware in the first instance. The rest is their choice. That is one of the challenging things about democracy. We may not always agree with others’ choices, but have to respect them. With hindsight I would do exactly the same again and continue to bite my tongue and try to be diplomatic. I’ve had my time and now this is theirs. I remember the first day at film school our enthusiastic lecturers took us to watch David Lynch’s EraserHead. I thought it was awful and had (and continue to have) no real idea what it is all about. That was 14 years ago. Last year I bought it on DVD for £5. I haven’t watched it since, but it’s still there.